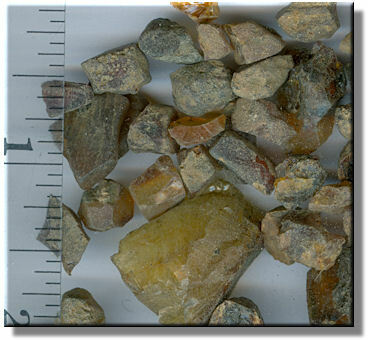 Amberica West is offering a few grades of rough Dominican amber. Gentle reminder that Dominican amber is considered to be some of the clearest and finest amber that is available on the market. Generally, Dominican amber has some of the best color and clarity of any of the ambers. It is considered fairly hard (for amber - remember amber is soft) and easy to work with. Prices are in grams. There are 454 grams in a pound. But remember that amber is light. A gram may NOT be more than you think. In other words, 10 grams is not a lot! We have not searched the amber for insects (honestly). You just never know what may show up! Finally, you may realize that these prices are rather inexpensive - they are. No reason to gouge people! The pictures were taken by grabbing into each grouping and taking a picture. So what you see is representative of what you get. We know that everyone does not want the exact grams that are below. The shopping cart is not an easy thing to configure for this type of purchase. So when you want some other amount in grams, just let us know by email and we will sent you a link so that you can purchase it by credit card, yourself. You will notice that there are 5 groups A through E. They are NOT in order of least to most expensive. 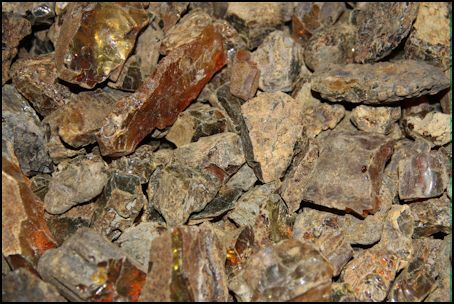 All of the amber below is from the Dominican Republic and is about 25 or 20 million years old. Pieces averaging from .25 inches to .6 inch in size (although many are just a bit larger.) This would be good material to fill up a jar or graduated cylinder - not expensive yet cool. Group B: Thumb sized pieces, ranging from .5 inches to several inches in size. The picture does show this well. Group C: And finally here is a bunch of very small amber bits. As you can see the sizes from the image below, this is material that can fill a jar or stuff you can just have fun with. Priced to sell, this will be a ball.We have a limited quantity of this material.